How do you get professional looking custom printed discs and inserts without breaking the bank? Let us take care of everything! 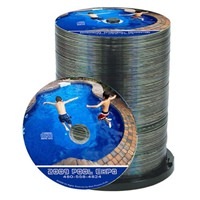 We offer a variety of custom disc printing services, such as CD, DVD, or Blu-ray on blank media. We also have great options for custom printed packaging inserts to truly customize your media project. We offer affordable, high quality products and services here at CDROM2GO!